Because of your belief in Jesus Christ, I write to plead with to further consider the words of Jesus Christ. I hope we agree that the basis of our spiritual life must be Christ and His words. Jesus said, “The words that I speak to you are spirit, and they are life” (John 6:63). By the words of Christ, I plead for unity between us in Him. We know that Jesus’ words will never pass away (Matt. 24:35), and that Jesus will be ashamed of those on judgment who are ashamed of His words (Luke 9:26). Christ’s words consist of more than the red print in our bibles. Jesus said that He gave these words to His Apostles (John 17:8), and would give all Truth to His Apostles through His Spirit (John 16:12-13). The Apostles affirmed that they did receive and taught these words (1 Cor. 2:13, Gal. 1:11-12, Eph. 3:3-5, 1 Thess. 2:13, 4:2, 2 Tim. 1:13). We must strive to base our faith upon the perfect and complete words of Christ. The reason that I want to write you is to address the words spoken by Dr. Reavis in your assembly via your television program on March 20, 2011. Dr. Reavis said that baptism is important and commanded by Christ, and in this, he is right. Yet, he also said that baptism is a work. This is conjecture. There is not one reference to baptism being a work in scripture. There is no scripture of anyone baptizing oneself when grace is “not of yourselves” (Eph. 2:8). Only speculation would degrade baptism to a work of boasting (Eph. 2:9). Though we are justified by grace through faith, remember that obedience to God is still essential to salvation though not the point of justification (Matt. 7:21, Heb. 5:9, Jam. 2:24). Dr. Reavis also placed salvation before baptism while Jesus placed salvation after faith and baptism saying, “He who believes and is baptized will be saved; but he who does not believe will be condemned” (Mark 16:16). Jesus was not referring to another spiritual baptism, but to the one baptism, which is in His name being established in the Great Commission. Jesus said, “Go therefore and make disciples of all the nations, baptizing them in the name of the Father and of the Son and of the Holy Spirit” (Matt. 28:19). This immersion in Jesus’ name is water baptism. Peter spoke before Cornelius’ house saying, “‘Can anyone forbid water, that these should not be baptized who have received the Holy Spirit just as we have?’ And he commanded them to be baptized in the name of the Lord” (Acts 10:47-48). Peter said earlier, “whoever believes in Him will receive through His name forgiveness of sins” (Acts 10:43, also 1 Cor. 6:11). Peter said in Acts 2:38, “Repent, and let every one of you be baptized in the name of Jesus Christ unto the remission of sins; and you shall receive the gift of the Holy Spirit.” This baptism was “unto the remission of sins” just as Jesus referred to His blood using the exact same phrase eis aphesin hamartion, “For this is My blood of the new covenant, which is shed for many unto the remission of sins” (Matt. 26:28). Neither Jesus’ blood was shed because sins were already forgiven nor was baptism because sins were already forgiven. To express the harm of diminishing baptism in the Gospel’s salvation, neglecting baptism’s role in salvation is to remove the burial of Christ from the Gospel. The Gospel saves us being the death, burial, and resurrection of Jesus Christ (1 Cor. 15:1-4). As I hope you know, we reenact the Gospel by dying to our sins, being buried by baptism into His death, and being resurrected into the new life (Rom. 6:1ff). We enter into Christ’s death by baptism and have new life when we rise from our baptism. How can we be resurrected when our faith will not submit to burying our body of sin? For Christ’s Spirit speaks of Christians being “buried with Him in baptism, in which you also were raised with Him through faith in the working of God, who raised Him from the dead” (Col. 2:12). Baptism is a willing submission to Christ and His Gospel. 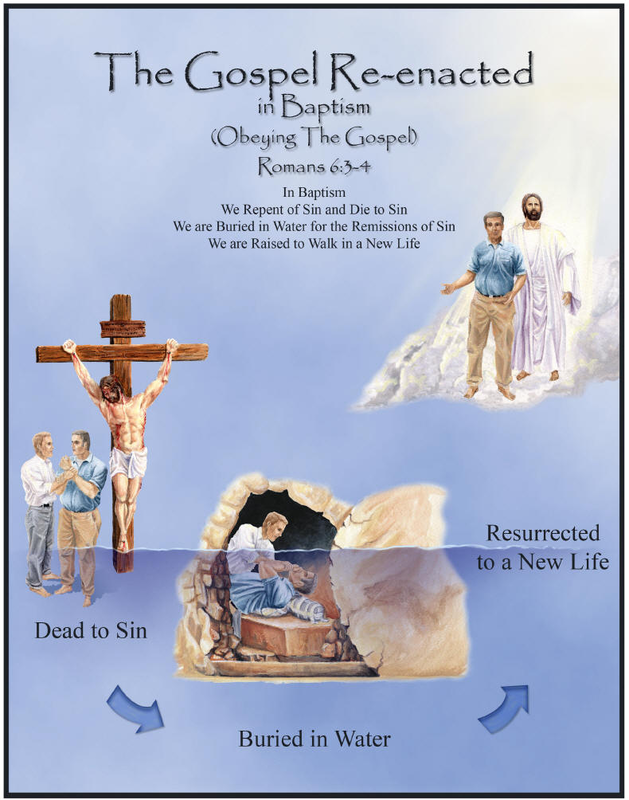 Baptism is the exact point that one is resurrected. “Therefore we were buried with Him through baptism into death…For if we have been united together in the likeness of His death, certainly we also shall be in the likeness of His resurrection…Now if we died with Christ, we believe that we shall also live with Him” (Rom. 6:4, 5, 8). Without a faithful submission to baptism, we are neither resurrected nor regenerated. I write to you to consider these essential parts to baptism in Jesus’ name. According to Acts 2:38, baptism must be the water immersion of a repented believer, in Jesus’ name, unto the forgiveness of sins, and by which the Lord adds you to His Church. Anything short of this is short of Christ’s words. If you have not believed and confessed your faith in Jesus to be Lord, then you are not saved yet (Rom. 10:9-10). If you were baptized neither being immersed in Jesus’ name, unto the forgiveness of sins, nor being added by the Lord to the Church, then you did not obey Jesus and you are not saved yet. There is much more to baptism according to Christ’s words but I conclude until further discussion. “And now why are you waiting? Arise and be baptized, and wash away your sins, calling on the name of the Lord” (Acts 22:16). Baptism is when our sins are washed away. Baptism is how we call on the name of the Lord being the exact moment of salvation. I plead with you in Christ’s name to reconsider your beliefs, your teachings, and your baptism in light of Jesus’ words. Let us all listen to Jesus, who said, “observe all things that I have commanded you” (Matt. 28:20) and “He who has My commandments and keeps them, it is he who loves Me” (John 14:23). I welcome your response. I am fully willing to honestly reconsider my position. I plan to present this as an open letter. You can contact me at […] or if you prefer by mail as sent by letter. Also read “Another Open Letter to the North Jacksonville Baptist Church“, and “Charles Spurgeon Differs from Today’s Baptists on Baptism“. Previous Previous post: Who Wrote the Bible, Bart D. Ehrman? When Is a Believer Saved by Grace? I plead with you to reconsider Scripture, and allow the Bible to challenge you. I am always willing to do the same. The Bible does not call baptism a work. God works powerfully to raise the believer from baptism and death in trespasses to become alive and forgiven of all trespasses (Col 2:12–13). We cannot change that or teach anything different. Baptism is passive for the repentant believer and the powerful working of God for those raised through faith. Furthermore, I know that you must know some of the Scriptures concerning baptism in the name of Jesus. There is one baptism that Jesus commanded and Peter proclaimed (Matt 28:19; Acts 2:38; Eph 4:5). The Scriptures are apparent that baptism in Jesus’s name is in water (Acts 10:47–48). That is the baptism referenced throughout 1 Corinthians. Peter declared that “baptism now saves” and through the resurrection of Jesus Christ (1 Pet 3:21). How can any Christian say anything different? Peter noted that those born again through the resurrection of Jesus Christ (1 Pet 1:3). We can’t change those things. We cannot change that baptism in the moment when one is united with Christ in His death and rises to newness of life (Rom 6:3–5). We cannot alter that baptism. If I read your letter correctly, you are saying one has to be baptized in order to be saved and go to Heaven. Then let me ask this: What about the thief that died on the cross that Jesus told that would be in Heaven with him that day? As far as I know, the thief was not baptized by being immersed in water. I know that we should be baptized but, it is not always possible. One must read all scripture concerning a topic in order to understand it completely, so I would like to hear what you have to say about the thief on the cross. Please know that I am not being argumentive, it is just that I truly want to understand the Bible and seek it’s truth. That is a good question. The thief on the cross may or may not have been baptized. The thief died before Jesus commanded baptism when He rose from the dead (Matt 28:19; Mark 16:16). That is the baptism for the forgiveness of sins (Acts 2:38; 22:16). That is the baptism that partakes of the reality of Jesus’s death, burial, and resurrection (Col 2:12–13; cf. Rom 6:4; 1 Pet 3:21). Baptism is the point of uniting in Christ’s death and the beginning of the newness of life (Rom 6:1–5). The thief died under the Old Testament system. However, Jesus’s death and resurrection completed the Old Testament bringing in the New Testament (Heb 9:15–17). After the thief died, then Jesus rose from the dead and commanded baptism. Of course Yvonne! You are right.